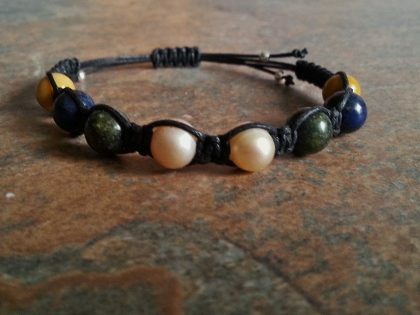 I’m excited to offer Spirit Bracelets. I intuitively/energetically select 4 or 8 beads (depending on your order) with my eyes closed (like oracle or angel cards). These are selected specifically for you. I will then do an intuitive reading of the energies of the stones that are working with you now, along with any other messages that come through. 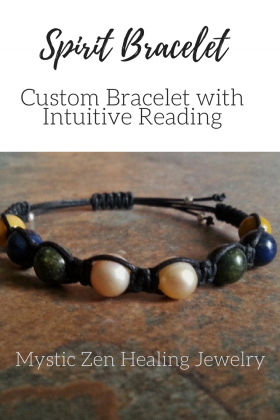 These beads are then made into a bracelet along with a detailed reading (see the reading for this bracelet below). This one is Mookaite Jasper, Lapis, Russian Serpentine and Pink Pearl. These 4 beads were chosen out of a total of 85 different beads. I begin by relaxing and setting my intention of selecting the stones that are most energetically helpful for you at this point in time. My eyes are closed during the process. The order of selection with keywords and phrases are listed below. Following that is a more in depth discussion of each stone with key aspects emphasized during the reading. The end includes the key messages incorporating all the stones. The Pearl is a reminder that “irritations” can be a gift. A message to allow for a new perspective of what is going on for us. Look at life with new eyes; see the beauty that surrounds you. The pink color is symbolic of the heart. By opening the heart more, we are able to see the world differently. A pearl is formed when the shellfish gets a grain of sand inside its shell. This causes an irritation and the shellfish encases it with the same material as its shell. What irritation can you lovingly embrace and turn it into something beautiful or meaningful? Can you shift your perception to see the “gift” of the situation and see a lesson that was learned? Pearl is also about purity. Is there something in yourself or environment (in the broadest sense of the word) that you need to change or let go of? Russian Serpentine helps to remove energetic blockages and heal limiting beliefs. Our limiting beliefs hold us back from reaching our full potential in life and most often these originate during our childhood years. Limiting beliefs are passed down through the generations. They are part of our life path so we may heal from and release them. Serpentine will also assist one to find their “place” in the larger aspect of life. It helps one to release fear of change and hardship to move forward with expectation and excitement. Lapis is a very spiritual stone. It helps to develop intuition and spiritual guidance. This is a stone of self-reflection and helps one move forward with a clearer picture of direction. Gifts and abilities as well as opportunities for growth become more evident with this stone. Mookaite Jasper works with the solar plexus and root chakras. The solar plexus chakra (located below the rib cage) is responsible for our self-esteem, confidence and how we shine out to the world (our inner sun). The solar plexus is also related to our processing of what and how we “digest” what we take into the body. This is a reminder to watch what you “eat” both food-wise and emotions. The root chakra is at the base of our spine and helps us to be more grounded (out of our mind and more present – less worry and anxiety). Like Serpentine, Mookaite also helps with clearing limiting beliefs, unhealthy patterns and ancestral lessons. The energy is available to you now to work on building your self-confidence, courage and self-esteem by letting go of patterns and limiting beliefs. Focus is available for solving conflicts as well as discovering your life purpose. Be open to transformation and growth, you are supported at this time. Trust your intuition! This can also be enhanced through meditation, especially through connecting with Nature. Spend some time just “being” with Nature to quiet your mind so your intuition and higher self can offer direction. Journal your experiences/meditations afterwards; you will be surprised with the amount of information and guidance that comes through for you. Remember to not judge what comes, just let the words flow onto the paper. Watch what you take into your body; nutritionally and emotionally. The pink of the pearl guides all these messages with gentleness and grace.